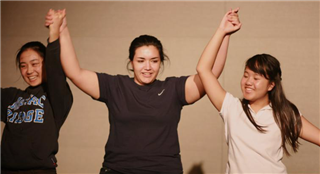 On March 13th, students in the Advanced Acting and Directing class performed the work of several student playwrights. Following a three-week intensive playwriting workshop with the San Diego Playwrights Project, classmates selected four plays to rehearse and showcase. 360 Huntington, by Matty Bernstein '15, follows the internal struggles of a young Harvard graduate running for Congress; Eye of the Storm, by Claire St. Marie '16, tells the tale of a little girl caught in the middle of her parents conflicting ideals; Fronteras Hechas Del Dinero, by Jennifer Curiel '15, is the story of a young Mexican girl torn between filial piety and academic ambitions; and Food Trends, by Margaret Zhao '15, is a sketch comedy on the nature of fad diets. Congratulations to the actors, directors and playwrights on an evening of fantastic, original productions!